Pea Soup Andersen's provides the perfect location for any function, from business meetings to wedding celebrations. 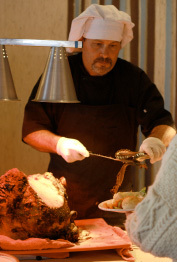 We would love the opportunity to serve as your host for your upcoming event. We offer private and semi-private banquet areas for your use and can accommodate groups of many shapes and sizes. The maximum occupancy for each room is listed in the chart below. We offer over eighty years of experience of impeccable service, expert planning and gourmet menus, that are customizable, which we use to help you create your event. 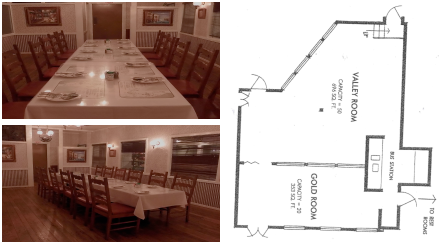 Our Gold Room is a long and narrow room that can accommodate up to 20 people. It has an old world feel with stained glass along the tops of its many inside windows. Our Valley Room is a long and narrow semi-private room that can accommodate up to 50 guests. It is a uniquely shaped room with windows overlooking our beautiful flower gardens. Our Pavilion Room is a semi-private room that can accommodate up to 80 guests. The Pavilion Room overlooks our flower gardens with a wall of windows. Our Juliette Room (named after our founding mother Juliette Andersen) is a private room that can accommodate up to 150 guests. The Juliette Room is a loft style room with its own private restroom facilities. It has three large chandaliers and a large staircase leading up to the room. Access to this room is by staircase. Our Buffet Bar (a pub from Liverpool, England that was shipped here in 1967) is a private room that can accommodate up to 245 guests. The Buffet Bar is a pub style room with its own private restroom facilities. It has an old world feel with many stained glass windows, a built in bar and a dance floor. This room offers a unique history with a feeling of warmth and tradition. Our Gazebo in the Garden is a semi-private garden that can accommodate up to 150 guests. There is a white Gazebo standing in the midst of our flower gardens. It is the perfect place to hold a Wedding Ceremony. For more information or to check available dates for your function please call the Director of Sales and Catering at (805) 688 - 5581 or email us your information at info@peasoupandersens.net. If you email us please include as much information as possible including: Desired Banquet Room, Your Name, Your Email, Your Phone Number, Desired Date of Event, Desired Time of Event, Number of Guests, Event Occasion and any additional comments.